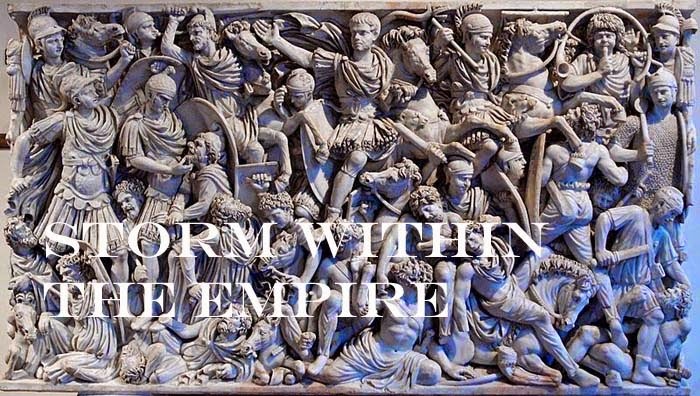 Storm within the Empire: Project Rome – the campaign maps for Hispania. Project Rome – the campaign maps for Hispania. There are four maps together which form the Iberian Peninsula, the lower half are the two Roman provinces of Hispania Ulterior and Hispania Citerior. All map squares outside the provinces are occupied by Spanish tribes representing one of the three DBA sub-lists; Iberian, Celtiberian or Lusitanian. An order, recently placed will give me four armies, one for each of the three sub-lists and an additional Iberian one using the 3Ax option in place of 4Ax. The campaign is designed as a two player game, one taking the role of Roman commander for Hither Spain (lower right corner) but having a dual role commanding the Lusitanian/Iberian tribes located in the upper left hand map and a second player commands the tribes of Celtiberia/Iberia with a dual role as Roman commander for Farther Spain. The length of term for serving consuls was one year, so players take exchange quadrants allowing both players to have operating in each map quadrant during a two year period. As consular armies were responsible for their provinces combining armies was not possible due to the distances involve and likewise, rivalry among the Spanish tribes made cooperation a very rare occurrence. The total score will determine which player served Rome or Hispania better. With four players, each begins in one quadrant and rotates in a clockwise direction each year. At the end of four years, scores are tallied to determine who was the better Roman or Spanish player; the Roman player earning a triumph and the Spanish player having a TV drama series named after him two millennium later. Each square is annotated with the topographical grouping as specified in DBA 3.0 and this means Hispania will have mostly hilly and steppe (plateau), forest and some arable terrain. As previously mentioned, each consular army can be split to operate separately from the main command and historically this was done on many occasions. Great idea to do it this way. Will be watching with interest! The idea of players having a dual role is not unique and The Sword and The Flame used a similar idea with British Commanders in one part of the Empire having a Native role elsewhere. Done in this manner both players will have gained experience to play both sides with equal tenacity. Tomorrow I shall post an overview of the campaign rules. Yep, heard of this before though never played that sort of thing. Like others, looking forward to following how this goes. Sounds like great fun!